I have to confess to having been hibernating until now. It’s been an odd winter here: first it was mild. Then it was cold. Then there was snow for a couple of weeks before it melted. Then it snowed again. And now it’s all gone. When it was cold, it was very cold. 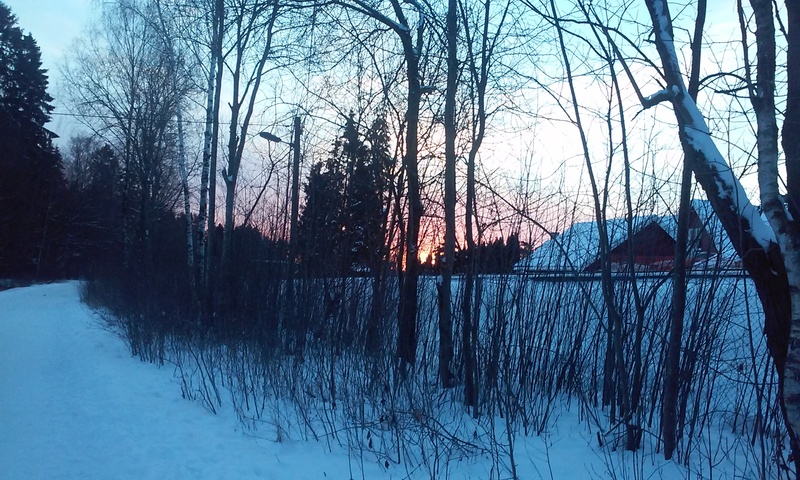 Temperatures dipped down to more than -10 degrees Celsius for days at a time. Then they would yoyo and jump into the positives. 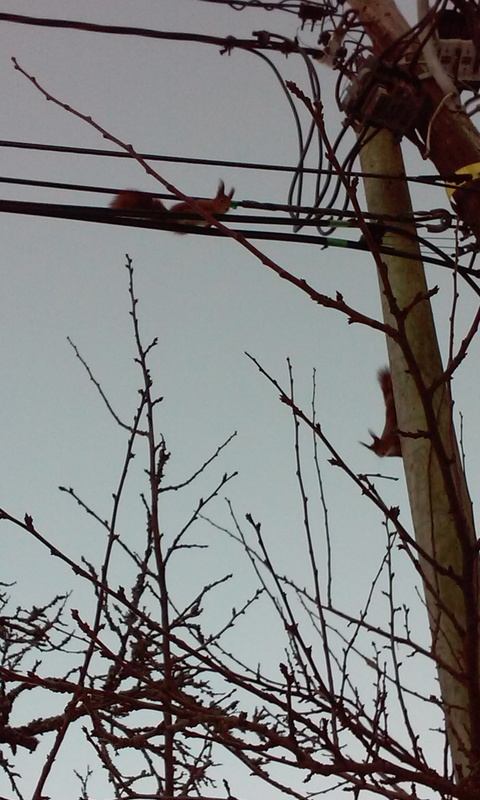 Not an especially typical winter here in Oslo and subsequently it’s been throwing everything into confusion including these red squirrels I saw the other day playing together outside. 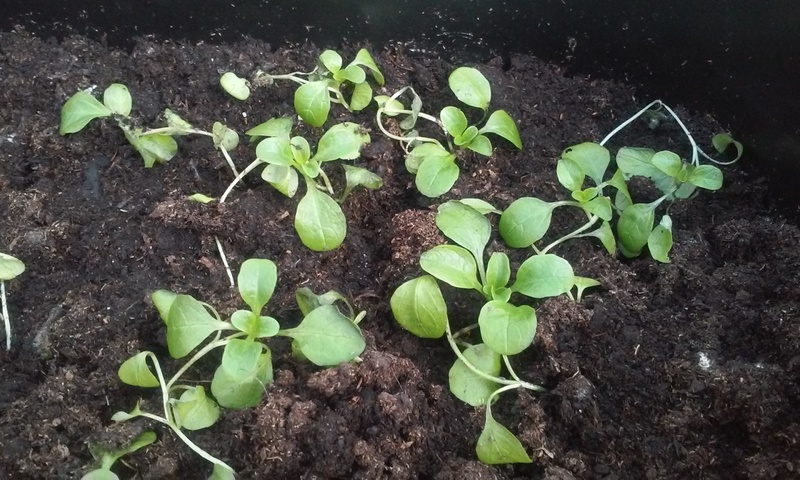 As far as growing in my winter cold frame goes… it’s been an interesting experiment so far. I’ve relied heavily on weather forecasts to track the fluctuating temperatures and prepare my cold frame on a daily basis. On cold nights, I’d cover the frame, and on those super cold days I’d leave the covers on, sometimes for days on end. the compost remained frozen so there was no real benefit to removing the covers. Moisture collected on the underside of the glass and I’d wipe the glass down every morning. When it got very cold it would have frozen before I’d had a chance to do it so formed a thick later of ice. 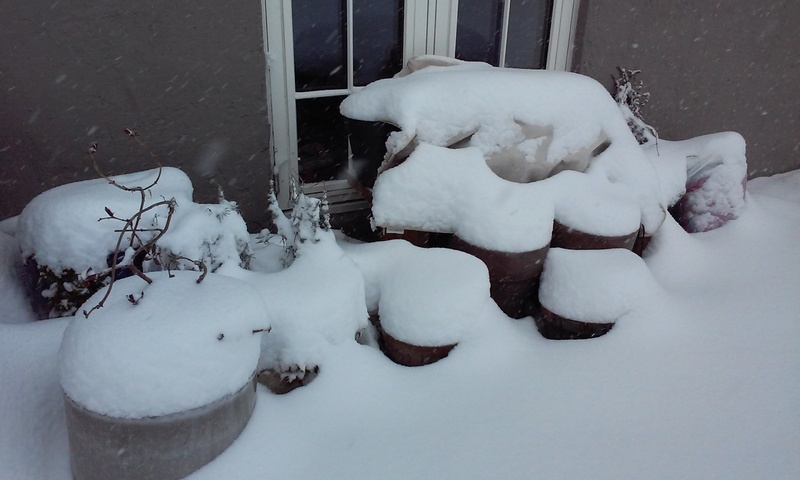 The plants seemed to be coping until the prolonged high freezing temperatures hit and then subsequent thawing. From the excessive moisture build up that followed, there was damping off which seemed to result in irreparable damage. Out of three containers, only the one with the Winter Purslane has survived significantly. This patch is just about hanging on! 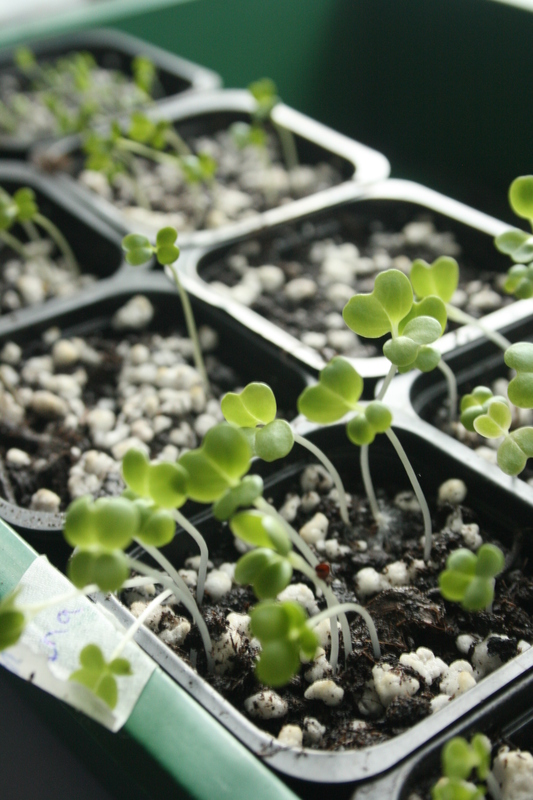 Sow winter seed varieties much, much earlier so that the plants are more established and are stronger before the cold sets in. Try insulating with wool (rather than fleece) during very cold periods. Protect the most exposed areas of the cold frame (in my case, the front) by buffering it from the harshest winds/temperatures. It may not be a coincidence that the purslane, situated at the back of the frame, suffered the least. 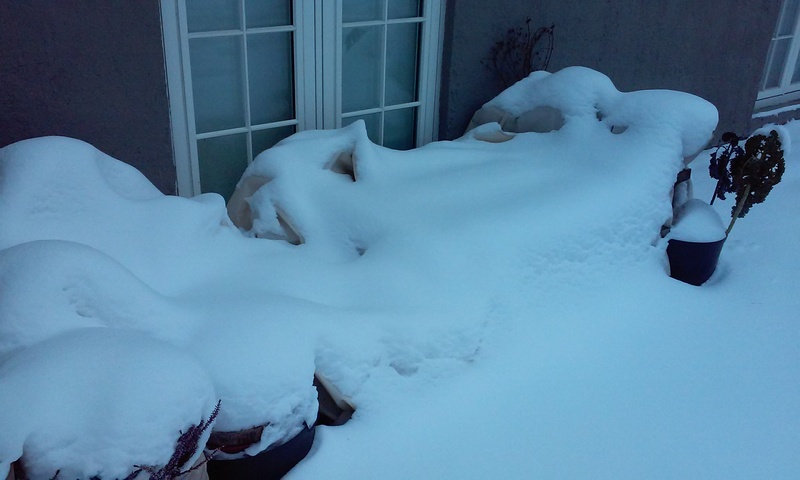 Slightly raise the containers off the ground (and insulate underneath) or submerge containers into the ground at least a few inches or more if it is practicable! Use an outdoor thermometer to monitor the internal temperature of the cold frame. It would be tempting to use a thermostatically controlled heater/heating element inside the cold frame but I think I’d prefer to wait until it’s warmer rather than grow with artificial heat. I’ve not yet figured out how to balance keeping the cold frame adequately ventilated to prevent the build up of condensation with maintaining adequate heat inside the cold frame on those colder days. 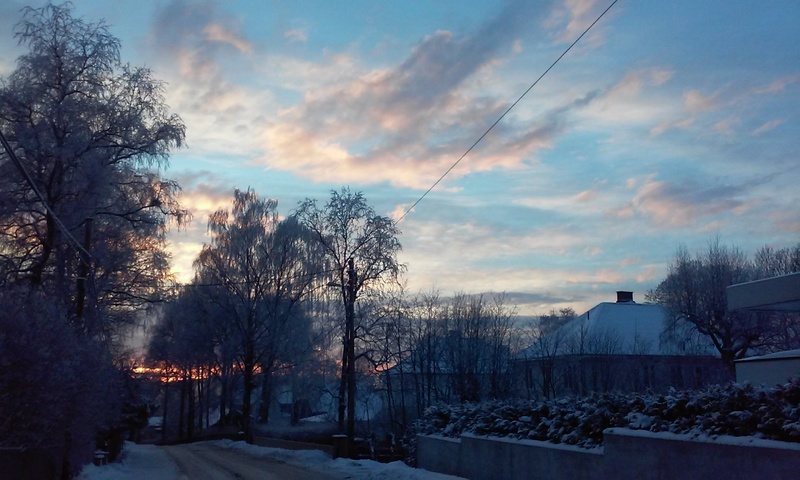 Another cold spell is expected in the next few days. Time to brace the cold frame again and perhaps try to figure that conundrum out. Meanwhile, I’ll start looking through seed catalogues and dream up what I can plant this forthcoming spring. Categories: cold frame growing | Tags: cold frame growing, coldframe, damping off | Permalink. Temperatures had been hovering under 10 degrees celsius over the past few weeks and I’d managed to harden off the seedlings so that I was able to leave the cold frame open for most of the daytime, closing it with it slightly agar over night. Now the temperatures have cooled right down and daytime temperatures are closer to zero during the daytime and dropping this week to below zero. 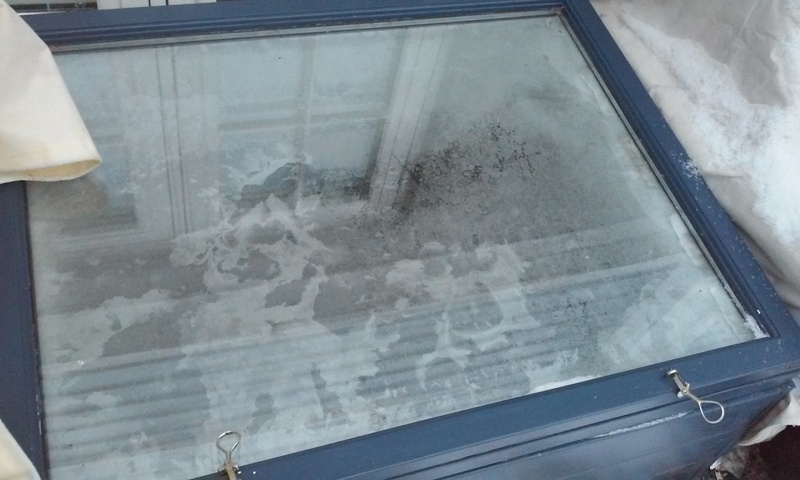 So I’m leaving the frame slightly open during the day and will close completely or cover it when it drops to its coldest. Growth so far has been slow but steady. Rocket salad and Lamb’s lettuce is still small but look healthy. The Red Giant and Cerbiatta are noticeably bigger and are doing by far the best. 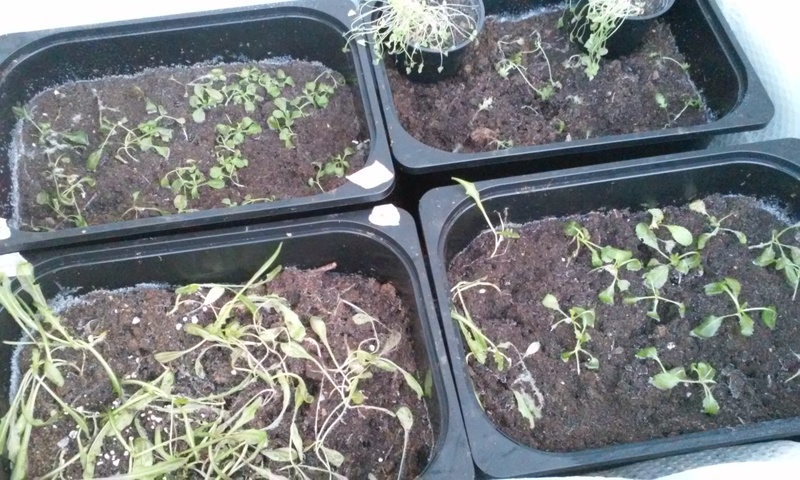 The Mizuna is struggling and I may replace the weaker plants with some Winter Purslane which is doing really well on my window sill. Some of the Merveille de quatre saisons salad is beginning to develop its distinctive orange tinge on its leaves. I found a glistening trail on the soil and a few leaves with bits chomped out of them (see above)…The unmistakable calling card of a slug. I checked all the planters and I couldn’t find it lurking anywhere. Luckily there’s no significant damage but I’m thinking of getting some copper tape to put around the rim of the planters or put more sharp gravel around the base. I need to be vigilant; I don’t want the little critters to have a feast before I do! Categories: cold frame growing | Tags: coldframe | Permalink. The building of the cold frame has been frustratingly slow this week. Dodging the downpours, I thought I’d never make it and I began to question my motives….The trials and tribulations of cold frame growing….before I’d even begun growing! But thankfully persistence pays off (eventually!) and I now have something that partially resembles a cold frame. The main reason I had for making a cold frame in the first place was because I hadn’t been able to find commercially made cold frames on sale here. In many ways though, it’s probably been a good thing as, besides from it costing less, it means I have been able to tailor one to suit the space that I’ve got. I’ve found an old window and bought some wood planks from the local builders’ yard. I’d initially tried to source reclaimed wood but it was taking too long to find uniform pieces that I could use. My kit also includes some galvanised nails, wood primer and paint. By far the most expensive element of this construction project has been the paint. Given this cold frame will have to withstand snow, rain and cold temperatures I’ve chosen the best exterior wood paint I could afford. This morning I finished the main construction, give or take replacing some of the nails on the sides which decided to go wonky towards the end just as the rain started to fall again (I’m giving them a mind of their own by the way; it was nothing to do with my wobbly hammering of course…). There’s something of rustic charm about my frame! Hopefully it will stand the test of time. I had to carry it inside to dry off so, at this stage at least, I can definitely vouch for it being very solid! I’ll shave off the posts so they are more neat and flush to the sides and then apply some wood primer on it. Even though the planks come pre-treated, the posts and sawn edges will benefit from a coat. Once all painted, it’ll be ready for the window to be attached onto it. The window itself I sanded down before applying some primer to the wood that hadn’t been painted before. Then I put a few coats of the paint. Here it is in progress. 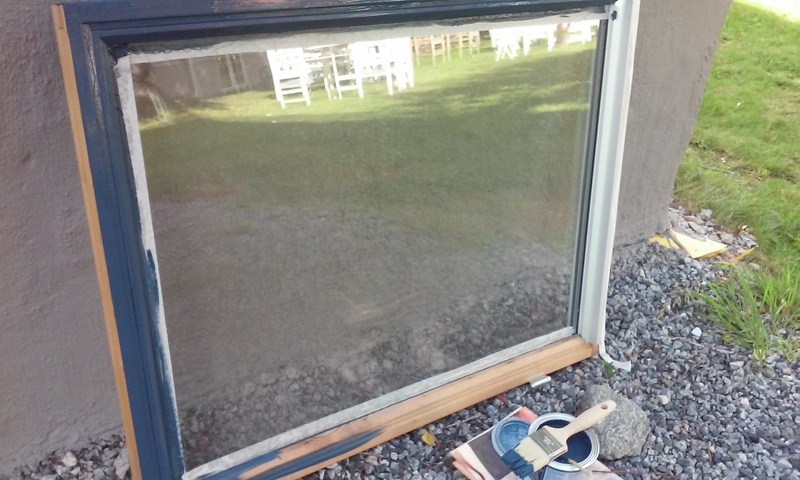 I hadn’t removed the hinge from the window as the window came complete with its frame so I’ll be able to re-attach the original hinge from the frame onto the cold frame. It wasn’t really planned this way but it has worked out well rather than have to buy a new hinge. 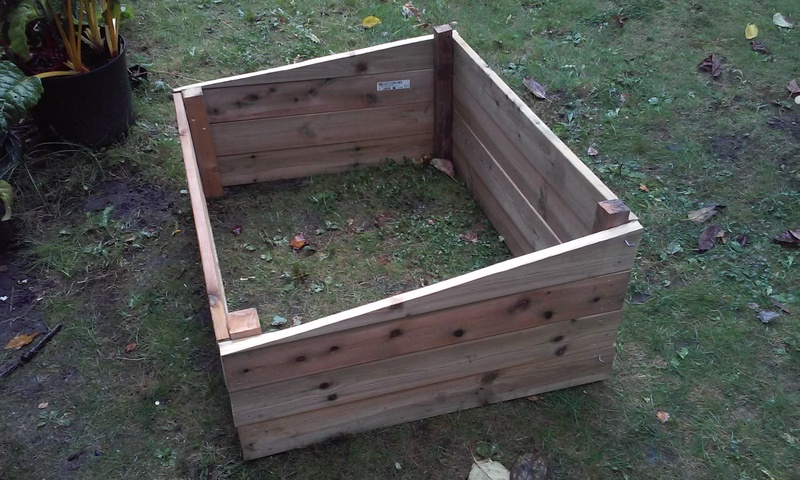 The shape of my cold frame corresponds to what I’ve read as being the most suitable for winter cold frames. Whereas summer cold frames can have a sharper angle of glass, winter cold frames by comparison should have a more shallow angle so as to capture as much as possible of the sunlight that sits lower in the sky over winter. I’ll position the cold frame next to my other plants, alongside the south-facing wall of my house. It will provide a sheltered spot but, more importantly, this direction will help the plants maximise the fewer hours of daylight there are over the coming winter months. Categories: cold frame growing | Tags: cold frame growing, coldframe | Permalink.